A new paper published in Environmental Research Letters finds the polarity of the Sun's magnetic field has significant influences on cosmic rays, thundercloud formation, and the number of lightning strikes. "The number of lightning strikes across the UK has been significantly affected by solar activity, according to new research." "Scientists say the Sun's magnetic field is bending the Earth's own field, increasing our exposure to cosmic rays." "These rays are believed to increase the number of thunderclouds and trigger lightning bolts in some locations. Over five years, the UK experienced 50% more strikes when the Earth's magnetic field was affected by the Sun." "The researchers believe the field is like a bar magnet, so as our star spins around sometimes the field points towards the Earth and sometimes away." 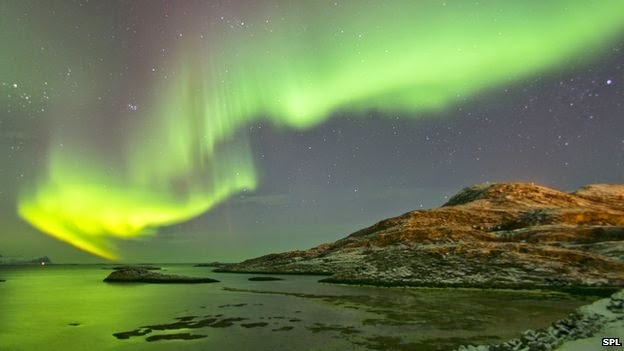 "What we found was there is significantly more lightning in the UK when the field is pointing towards the Sun than when its pointing away which was surprising," "What we think is happening is that the Sun's magnetic field is pulling or pushing on the Earth's field and that's letting energetic charged particles down into the atmosphere at different locations and the idea is that these actually trigger lightning." The Svensmark cosmic ray theory of climate is one of many solar amplification mechanisms described in the literature, inversely linking solar magnetic activity to cosmic ray seeding of cloud formation. This new study suggests not only solar magnetic activity but the polarity of the Sun's magnetic field may affect thunderstorm formation and lightning activity. Thunderstorms in-turn have a large negative-feedback cooling influence on climate to help maintain climate homeostasis [also see the thunderstorm thermostat hypothesis]. Thus, solar magnetic polarity could also be another potential solar amplification mechanism. The number of lightning strikes across the UK has been significantly affected by solar activity, according to new research. Scientists say the Sun's magnetic field is bending the Earth's own field, increasing our exposure to cosmic rays. These rays are believed to increase the number of thunderclouds and trigger lightning bolts in some locations. Over five years, the UK experienced 50% more strikes when the Earth's magnetic field was affected by the Sun. The manner is which lightning bolts are triggered has long puzzled scientists as the air is known to be a good insulator of electricity. Something else needs to come into play to conduct the electrical charges built up in thunder clouds down to the ground. Since the 1990s, researchers have speculated that the magnetic activity of the Sun could be linked to lightning on Earth. Current theories hold that high energy particles called galactic cosmic rays provide the necessary link that lets the current flow into a lightning bolt. This latest work suggests that the orientation of the Sun's magnetic field is playing a significant role in the number of strikes. The researchers believe the field is like a bar magnet, so as our star spins around sometimes the field points towards the Earth and sometimes away. "What we found was there is significantly more lightning in the UK when the field is pointing towards the Sun than when its pointing away which was surprising," said Dr Matt Owens from the University of Reading, the lead author on the study. "What we think is happening is that the Sun's magnetic field is pulling or pushing on the Earth's field and that's letting energetic charged particles down into the atmosphere at different locations and the idea is that these actually trigger lightning." "For lightning, you need a thin conducting channel like a wire, and galactic cosmic rays can provide this thin column of ionisation in the atmosphere." 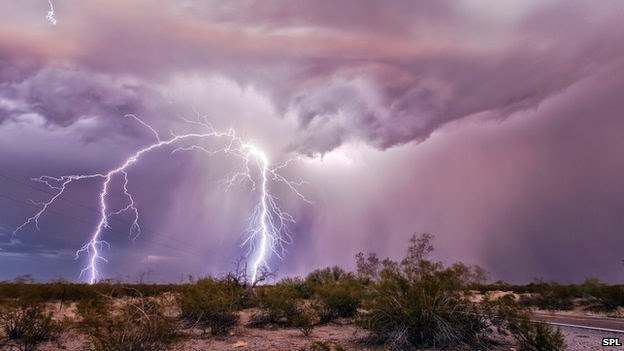 The researchers found that over a five year period between 2001 and 2006, the UK experienced a 50% increase in thunder and lightning rates when the solar magnetic field was pointed away from the Earth. In Summer, the rates were higher, with an almost doubling of lightning strikes in July compared to when the magnetic field was pointing in the other direction. Because of good quality records, the scientists confined their work to the UK. They believe that the same effect is playing out over the globe but with different results, so while lightning might increase over Britain, it may have decreased over Canada or Siberia. While the researchers admit that the mechanics of how cosmic rays might trigger lightning is still a theory, they believe that their discovery of an association with the movements of the Sun's magnetic fields, could lead to better predictions of thunder and lightning events. As the nature of the Sun's magnetic fields are well known, meteorologists could incorporate this information into weather forecasts. "If you can get a weather forecast good to a week ahead then yes I think we could say something about lightning rates a week ahead as well." Recent research has also focussed on how climate change is likely to increase the amount of lightning strikes around the world. Dr Owens believes that the mechanism that his study identifies still holds, regardless of the temperature. "If you've got more thunderclouds, you get more lighting but I still think the triggering of that lightning could be dependant upon the Sun and its magnetic field." The researchers now want to extend their work to look at longer historical records to see if the correlation still stands. According to Dr Owens, some scientists are keen to take a more "Benjamin Franklin" approach to prove the theory. "The fundamental lightning triggering experiments are difficult to do in the lab and difficult to measure in situ," he said. "Some of my colleagues have been trying to launch charge sensors on balloons, through thunder clouds - it makes our health and safety officers sweat!" Observational studies have reported solar magnetic modulation of terrestrial lightning on a range of time scales, from days to decades. The proposed mechanism is two-step: lightning rates vary with galactic cosmic ray (GCR) flux incident on Earth, either via changes in atmospheric conductivity and/or direct triggering of lightning. GCR flux is, in turn, primarily controlled by the heliospheric magnetic field (HMF) intensity. Consequently, global changes in lightning rates are expected. This study instead considers HMF polarity, which doesnʼt greatly affect total GCR flux. Opposing HMF polarities are, however, associated with a 40–60% difference in observed UK lightning and thunder rates. As HMF polarity skews the terrestrial magnetosphere from its nominal position, this perturbs local ionospheric potential at high latitudes and local exposure to energetic charged particles from the magnetosphere. We speculate as to the mechanism(s) by which this may, in turn, redistribute the global location and/or intensity of thunderstorm activity. Figure 1. Time series of the datasets used in this study. (a) The percentage occurrence of away (A, red) and toward (T, blue) heliospheric magnetic field sectors. (b) RL, the daily UK lightning stroke rate from the ATD radio network (black) and its mean seasonal variation (green). (c) RTH, UK thunder day rate (black) and its mean seasonal variation (green). All data have been 27 day averaged for purposes of plot clarity, but all analysis in this study is performed on daily data. They failed to cite the work of Nir Shaviv, which I think was a bit naughty of them. Because he's in the "denier" category? Which paper by Shaviv should they have cited? Which paper by Shaviv should htey have cited?